What happens if the bank’s appraisal comes in too low? As a buyer or seller in NYC, you may be wondering what options exist if the appraised value is below the contract price. In this article, we explain everything from how the appraisal rebuttal process works to how to prevent a low appraisal in the first place. What happens if the appraisal is lower than the purchase price? What are next steps if an appraisal comes in too low? 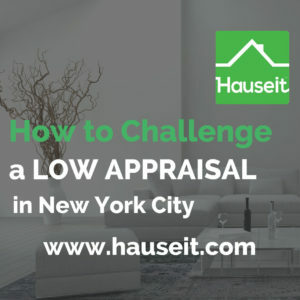 How can I contest a low appraisal in New York City? Can a buyer back out if the appraised value is too low? Can a seller back out if the appraisal comes in low? Is paying over appraised value a good idea in NYC? If an appraisal comes in lower than the sale price, it means that the buyer’s bank will only issue a mortgage based on the appraised value as opposed to the purchase price. This results in a financing shortfall (also known as an appraisal gap) for the buyer. The shortfall of $40k represents a financing (appraisal) gap for the buyer. Because banks don’t typically increase the ‘Loan to Value’ (LTV) as a response to a low appraisal, it means that the financing shortfall must be covered through the buyer putting down an extra $40k on the purchase. If the buyer has an appraisal contingency or a minimum loan amount contingency, it means that he or she is entitled to cancel the contract as a result of a low appraisal. However, most buyers and sellers will make an effort to keep the deal alive by utilizing any number of low appraisal response strategies which we explain below. The easiest response to a low appraisal in NYC is for the buyer to increase his or her down payment to cover the appraisal gap. If the appraised value is extremely close to the contract price, most buyers should be amenable to putting slightly more down on the purchase. If the appraised value comes in way lower than the purchase price, most buyers will be resistant to increasing the down payment. If you are buying a co-op apartment, increasing the down payment will reduce your post-closing liquidity and put you at risk of not meeting the co-op board’s financial requirements. The easiest way for the seller to solve a low appraisal situation is to agree to reduce the contract price to the appraised value. Most sellers will be resistant to this idea, especially if they feel that the appraisal is inaccurate and out of touch with the market. The most common approach is for the buyer and seller to renegotiate the contract price. One common proposal is for the buyer and seller to meet in the middle and set the new contract price as the midpoint between the appraised value and the original purchase price. If the buyer and seller cannot agree on a new contract price, the easiest next step is for the buyer to apply for a mortgage with another bank. Applying with a new bank means that another appraisal will be ordered. Often times buyers are resistant to applying with another bank since they will have to pay for another appraisal. In addition, a buyer who has secured an attractive interest rate lock will be even less interested in applying with a new bank (presumably at a higher interest rate) later down the line. Furthermore, applying with a new bank can often delay the co-op board approval process by two to three weeks. Submitting an appraisal reconsideration with the buyer’s lender is another way to respond to a low appraisal. Most appraisal challenges will only be seriously considered if there are factual errors in the appraisal or if the appraiser did not include the most relevant comparable transactions. We explain the process for an appraisal rebuttal in detail below. A buyer can contest a low appraisal in NYC by submitting an appraisal reconsideration with his or her lender. The appraisal appeal process typically takes around two weeks. The first step in an appraisal appeal is for the buyer, seller, listing agent and the buyer’s agent to thoroughly review the appraisal provided to you by the lender. When reviewing the appraisal, the most important things to look out for are factual errors and key comparable transactions omissions. Most banks will only allow the buyer to contest the appraisal if there are factual errors in the appraisal or key omissions in the comparable transactions. Some examples of factual errors include incorrect square footage and inaccurate room and/or bedroom count for the comparable properties. It typically takes around two weeks to hear back from the appraiser once the buyer has submitted the items for the challenge to his or her mortgage banker. When the challenge is complete, the appraisal firm will provide the buyer with an ‘Appraisal Reconsideration Response’ which responds to each additional comparable or factual error presented by the buyer. GCR (Geographically Competent Review) concluded no change in value as the appraisal report’s stated opinion of value and quality is acceptable. GCR concluded the appraisal report’s revised value of $[ ] and quality is acceptable. GCR concluded the appraisal’s quality is unacceptable and/or is unable to determine a value. If there is an increase in the appraised value, the bank will be able to lend against the new appraisal value. If there is no change in the appraisal price, the bank will not be able to increase the size of the loan. Yes. A buyer can back out of a deal if the appraised value is lower than the contract price provided that there is a contingency in the contract permitting him or her to cancel the transaction. If the contract is non-contingent, then the buyer is obligated to proceed with the deal and make up for the appraisal gap. Yes. If the seller is unwilling to lower the contract price to the appraised value and the buyer has a mortgage contingency, the buyer is permitted to cancel the transaction. In other words, the seller can entice the buyer to cancel the deal by not agreeing to sufficiently reduce the contract price. It depends. If you feel that the appraisal is inaccurate, then you should not place too much weight on the fact that the appraised value is below the contract price. On the other hand, if you engaged in a frenzied bidding war and feel that you’ve overpaid, then perhaps it’s a good thing that you (hopefully) have an appraisal contingency which may allow you to renegotiate the purchase price. Over the course of a long term hold period, agreeing to a slightly high purchase price is immaterial in the face of annual price appreciation and all the other benefits of owning vs. renting in New York City. How can I prevent a low appraisal? What is an appraisal rebuttal in NYC? How long does an appraisal rebuttal take? How often do appraisals get changed? While there’s no way to directly stop an appraiser from issuing a low appraisal value, there are ways for both the buyer and seller to anticipate and mitigate the risk of a low appraisal. As a buyer, you can be prepared for a low appraisal by locking an interest rate and applying for a mortgage with multiple banks early on. Although you’ll have to pay for multiple appraisals, doing this will give you two chances on the appraisal. This will save you time and money compared to waiting for one appraisal and then starting an entirely new loan process (possibly at a higher interest rate) after you’ve received a low appraisal with the first bank. As a seller, you can protect against a low appraisal by negotiating appraisal protection as part of your deal terms. If you are listing in a seller’s market where bidding wars are common, there is a real risk of a low appraisal. If the contract price is $800k and the appraised value is $750k, the language above would protect the seller from the first $20k of difference between the appraisal and contract price by obligating the buyer to make up the difference. In other words, the buyer would not be permitted to back out of the transaction if the seller adjusted the contract price to: $800k – $20k = $780k. Your listing broker can also minimize the risk of a low appraisal by providing the appraiser with comps for his or her review. While there’s no guarantee an appraiser will review and use the comps provided, the suggested comps may nonetheless help guide the appraiser to a more accurate appraised value. An appraisal rebuttal is the process of challenging the appraised value in the original appraisal. Appraisal rebuttals typically take two weeks to process once the buyer has submitted a list of items being contested in the appraisal. While it’s certainly possible for an appraisal rebuttal to result in an increased appraisal value, it’s not likely. Most appraisal challenges will only be seriously considered if there are factual (not subjective) errors in the appraiser and the appraiser has omitted glaringly obvious comparable transactions from his or her original report. Pro Tip: As a buyer, the more effective strategy for handing a low appraisal is simply to apply with another bank and order a new appraisal! The appraisal rebuttal process takes approximately two weeks. The specific timeline for receiving an Appraisal Reconsideration Response depends on the workload of the bank and the appraisal management firm handling the appraisal challenge. Truth be told, it’s very difficult for an appraisal to be changed. As a buyer, you can certainly submit an appraisal appeal to your lender. If your appraisal has glaring factual errors, then it’s always possible that the appraised value will be increased. Even if the appraisal appeal results in an increase in the appraised value, it still may not match the contract price. Often times it’s much easier simply to apply for a loan with another bank and order a new appraisal. Your buyer’s agent can also help you determine whether your specific apartment is at risk of a low appraisal. If you are buying in a hot market, one way to save time and money is to apply for financing with multiple banks early on. Doing this will give you the protection of two interest rate locks and the opportunity to hit the contract price with two separate appraisals.